"Wow. This product saves you a lot of time when backing up your SQL Server databases. The desktop version is simple to use and free. 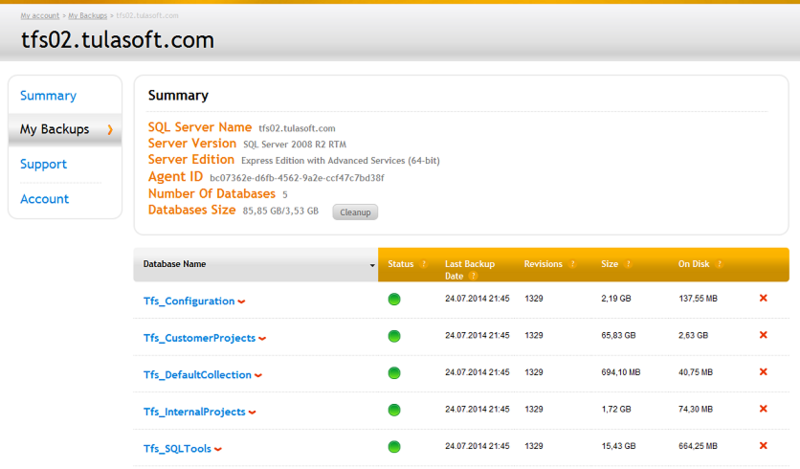 The cloud service is a nice addition for those who want ultimate database security." Simple and straightforward interface. Built-in wizards make the backup process simpler, allowing the user to focus on tasks that require her attention and leaving routine tasks to the program. 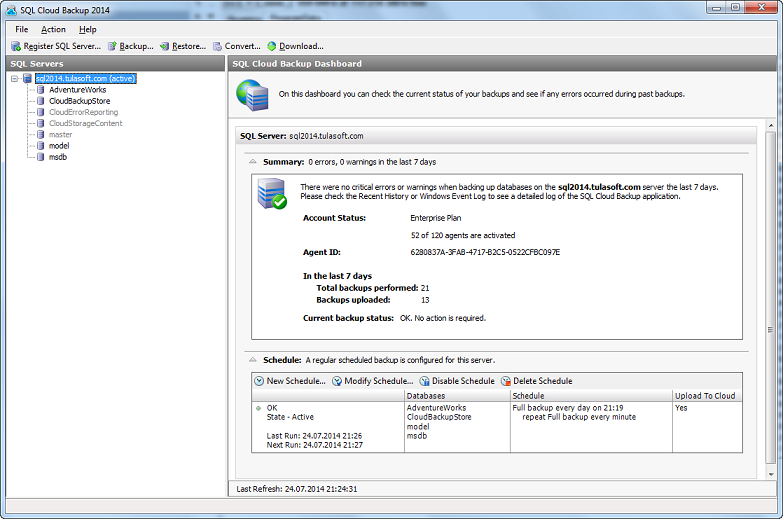 Back up SQL Server 2005 – 2014 databases to a local disk or network drive. Support for all versions and editions of SQL Server starting from SQL Server 2005. Multiple-file database support. Back up databases spread across multiple files clustered into one or more file groups. Back up FILESTREAM data. The program supports backing up FILESTREAM data – the unstructured data that may be stored outside the database. 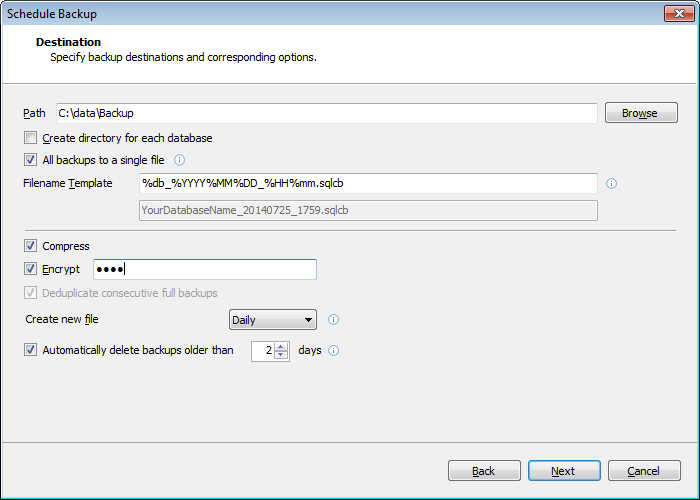 Consecutive backups with data deduplication. During the initial backup the program saves a complete database copy to a file. For all subsequent backups it saves only the blocks that have been modified or created since the last backup to the same file. This process, called ‘data deduplication’, enables you to create regular backups in virtually no time and ensures you always have the latest full backup on hand when you need to restore your database. On average, this feature reduces the file size backups by a factor of 100 as compared to the file size required for regular full backups. Quick and simple restore. When restoring your database to the most recent state you have to deal with only one backup file, rather than a collection of files. Compression. Compress your backups up to 85% and save disk or cloud storage space. Encryption. Backups created in SQL Cloud Backup can be encrypted using the AES-256 encryption algorithm, which provides your data with the ultimate level of protection from unauthorized access. If you use the optional cloud backup feature together with the free edition of SQL Cloud Backup, you can be sure that your data stored in the cloud is safe, because you are the only one who knows the encryption passphrase. Automatic revision integrity check. Each backup operation is followed by an automatic revision integrity check. This operation ensures that a backup copy is healthy and has no errors before it is written onto the disk or uploaded to the cloud for permanent storage. Scheduled backups. The program comes with a built-in scheduler and enables you to configure a backup schedule by choosing a pre-defined schedule or creating your own custom one. Cloud mirroring (available with a cloud backup plan). In addition to saving your backups locally, you can set the program to automatically upload them onto a cloud server hundreds of miles away. This way you can be sure that your database will be recovered in case a disaster causes you to lose both your database and its local backup copies. In-program cloud integration. With a cloud backup plan you can link the program to your online account for automatic, hassle-free backups to the cloud. Full information about your database backups stored in the cloud is available in an online Customer Portal. Alerting the user about errors.